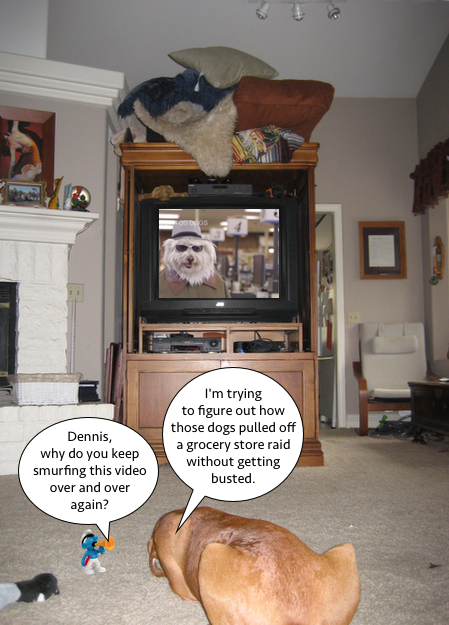 yes thats rite theez dogs on teevee hav sumhow pulld off a shopping trip!!! wenever i try that i seem to end up gitting busted!!! now aparently this is not in fakt a dokyoomentry like my blog it is sumthing wot is kalld advertizing!!! and the peepul wot mad it won a millyun green paypers!!! so kleerly wot i need to do is git myself a peese of this so kalld advertizing bizness!!! 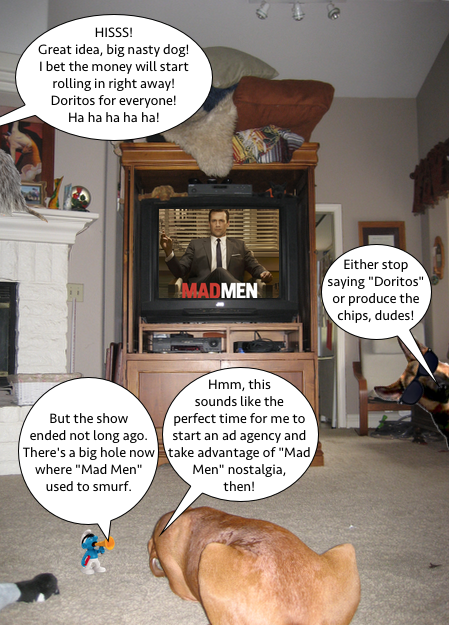 and sinse this mad men show wuz so popyoolar i no eksaktly how to kapitalize on it!!! ← Wordless Wednesday: Am Not Helping. Too Tired. Wow, did you ever pick the wrong name, Dennis! People are probably going around the block to avoid walking past your door. Would you consider changing the name? We can’t wait to see what commercials you come up with. Give it time, Dennis….we are sure some one will need your mad skills!!! This is definitely one of your better schemes to get rich quick. You just need to give it a little time, say 10 years or so. ok, bye. I can’t wait to see the commercials you produce! Go Dennis Go! Dennis, any commercial you create will be a Super Bowl winner for sure!!! Wow, anything to score those chips is a good thing! Maybe that little kid in the Darth Vader outfit can help out…he seemed to really make a good go of the commercial gig. As for the pigeons, I would suggest a really big drop(pings) cloth. BOL. I hope you earn bunches of delish chippers. Dennis, I don’t think people like pigeons all that much. Over wise, totally fool proof! Dennis, Very cleaver! I think you need to be the creative director for the Super Bowl. Oh Dennis we LOVE it! 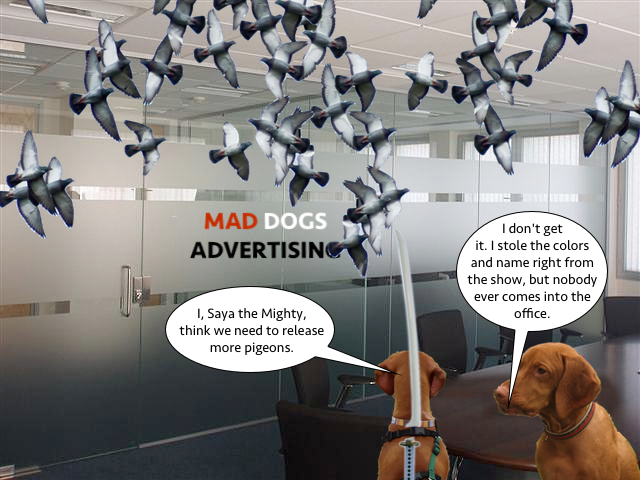 A bit worried about the pigeon poop though…. Good luck with yur new scheme ……er mee meenss ca-rear mee furend!!! 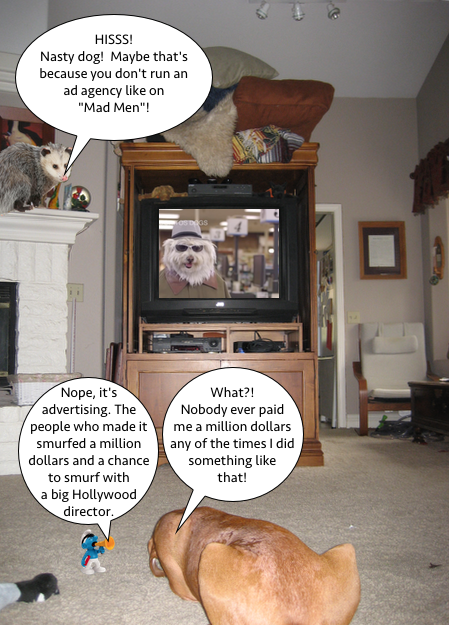 Mee finkss you need to advertise yourself Dennis….an maybe Mad Men should bee “Mad Doggiess”….mew mew mew….